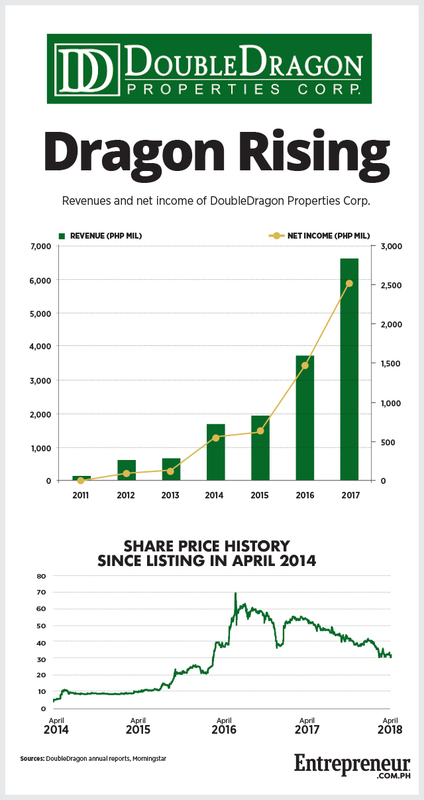 The Philippine Stock Exchange (PSE) has approved on May 29 the application of listed real estate firm DoubleDragon Properties to launch a follow-on offering, allowing the company to sell up to 150 million new shares at a price ranging from Php30 to Php40 a share, the company announced in a press statement. In a previous release on April 20 after securing approval from the Securities and Exchange Commission (SEC), the company said the new shares will be priced at a maximum of Php50 per share, which represents a premium of 58 percent above DoubleDragon’s closing price of Php31.55 per share that day. The company said it would announce the final price closer to the start of the offering. The minimum number of shares that investors can buy was set at 100 shares. Additional stocks can be bought in increments of 100 shares. Established in 2010, DoubleDragon is headed by billionaire Edgar “Injap” Sia II, who co-founded the company with Jollibee Foods Corp. founder Tony Tan Caktiong. Its property developments span four sectors—retail, office, hospitality and industrial—with its most established brand being its CityMall chain of provincial malls. According to Sia, DoubleDragon’s chairman and CEO, the company’s follow-on offering is targeting investors who weren’t able to participate in its initial public offering (IPO) in 2014. A follow-on offering is a share issuance done after a company has already listed on a stock exchange—that is, after a company has already launched its IPO. According to its prospectus, up to 80 percent of the newly issued shares will be offered to institutional investors based outside the Philippines, a market Sia hopes to tap with this follow-on offer. The final share price and timetable will be announced by the company at a later date. Interested investors are urged to read the offer’s prospectus for more information on the company and the follow-on offering. The offer’s international bookrunners and lead managers are Credit Suisse (Singapore) Ltd., Maybank Kim Eng Securities Pte. Ltd. and UBS AG (Singapore Branch). Its domestic lead underwriters and bookrunners are BPI Capital Corp. and Maybank ATR Kim Eng Capital Partners Inc. Lend Php5,000 or More to the Gov’t for 3 Years and Earn 4.875% p.a.